With Inadequate Health Infrastructure, Can Ayushman Bharat Really Work? An uncritical promotion of privatisation of healthcare at the cost of public money without proper regulation would do more damage than good on fiscal and health fronts. Ayushman Bharat National Health Protection Scheme (NHPS) has attracted considerable attention since its announcement in the 2018 Budget Speech. It aims to achieve universal access to primary, secondary and tertiary healthcare with two components. The first is to upgrade the existing 1.5 lakh sub-centres into Health and Wellness Centres (HWCs) for ensuring primary – especially non-communicable diseases (NCDs) – care. The second is to provide financial protection through the National Health Protection Scheme to 10.74 crore families with Rs 5 lakh coverage for accessing secondary and tertiary care from public and private providers. So far though, the scheme has not been analysed with reference to other documents and plans from NITI Aayog. An analysis like this will help locate NHPS in relation to the government’s larger and long-term plan of transferring the responsibility of public health to the private sector. Studying these three policies together, one could, in fact, see a massive drain of public money and public institutions into the private sector. Take the NITI Aayog guidelines for district hospitals. It says that a 50-bed and 100-bed private facility will be co-located within the identified district hospitals for treating select NCDs. They must have a fair amount of patient load for establishing the PPP, such as having an average per day out-patient load of around 1,000 patients in the last two years. 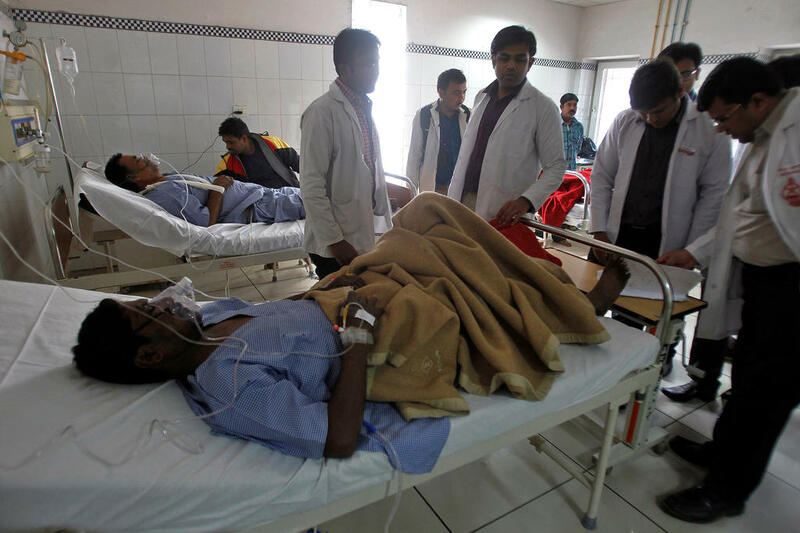 India has 779 district hospitals and 1,108 sub-district hospitals. All these hospitals may not fulfil the patient load criteria of 1,000 patients. NITI Aayog’s document recommends establishing downward linkages with primary health centres (PHCs) and community health centres (CHCs). They will help in ensuring patient load through referral in district hospitals, where the project is being implemented. But the network of PHCs (25,650) and CHCs (5,624) is not as widespread relative to the existing 1,56,231 sub-centres (SCs) spread across India’s remotest rural areas. In order to establish a robust referral system through downward linkages, NHPS has identified 1.5 lakh SCs for upgrading them to HWCs. Another coming-together of these documents is that one of the listed major focus of HWCs is to detect NCDs and refer patients upward in the facility chain. Now, this would directly fulfil the patient load requirements of the PPP project for NCD care. Thus, HWCs would boost PPP implementation in district hospitals by increasing the patient load. If the NITI Aayog plan goes forward as is, better performing district hospitals would find it hard to function well. The staff here would be engaged for PPP implementation. They would refer patients and facilitate reimbursement of expenditure of individuals incurred in PPP facilities. This would be through chief minister wellness funds and/or state/centre level financial protection schemes. The hospital authority will even have to allocate space within built-up structures and on hospitals’ vacant land. These public institutions at every level – health and wellness centres, primary health centres and community health centres – seem to be all geared and lined up towards ensuring patient loads for opening up the PPP in district hospitals. This shows a harmony between both NHPS and NITI Aayog’s plans. Ultimately, both are working towards a greater role of the private sector in public health. This is the beginning of a process where every public health institution will be made available to facilitate the already dominant private players. HWCs, in addition to detection, also aim to cater to the prevention of select NCDs (mental health, adolescent health, old age care, palliative, eye and dental cares, lung disease, hypertension, diabetes, common cancers, etc.). This seems to be a tough ask, especially in a system where staff shortages are very acute. The ‘human resource for health’ requirement for existing SCs is estimated to be around 12.6 lakh by 2022. At present, over half of them do not have an even composition of male/female health workers. The staff shortage (including specialists, doctors, radiographers and technicians) is even more acute at primary and community health centres, which are supposed to cater to such needs. Also read: Who Is Paying for India’s Healthcare? The upgraded HWCs will require even more specialists and technicians equipped with modern technology to cater to detection and prevention needs of NCDs. This does not seem like a reality given the already existing shortages. Given the huge deficiency of health personnel and technicians, it would be difficult to address NCD care with the allocated Rs 1,200 crore for HWCs in the recent budget. This amount would essentially be only Rs 219.18 per day per HWC. With this paltry amount, it is practically insufficient to rename sub-centres as HWCs and also meet administrative and staff needs. The government, however, has made it clear that funds will not be a problem, as PPP contracts can be engaged. The process of engaging contractual staffs and PPP has been enforced even at higher levels of public facilities in other states. Over time, the infrastructure and human resource of public health institutions look poised by the government to be passed over to private players. The National Health Policy 2017 (NHP) spoke about “strategic purchasing,” which is a reference to private players having a buy-in to public health. The announcement of the high insurance coverage under NHPS can foster the strategic purchasing agenda of NHP 2017 at a pan-Indian level for ensuring access to secondary and tertiary care services. Government documents suggest that strategic purchasing would play a stewardship role in directing private investment towards those areas and those services for which currently there are no or few providers. Insurance, however, does little to encourage and redirect private investment towards critical gap-filling in the past – though it helped the corporate medical industry with a monopoly over a few concentrated in urban metropolitan areas. Such concentration has large implications for costs and access to hospital care in vast areas where no or few providers exist. RSBY beneficiaries could only access around six times less hospitalisation care in districts where hospital networks are less extensive. The patients ended up paying over three times higher a medical cost, when care received outside from the district/state due to non-availability of facilities in districts they reside. And yet the NHPS is not seeking to increase the hospital network and is looking to burden an already thin one. Under the insurance-based financing mechanism, a majority of scheme holders prefer to avail private services than public, resulting in directing public money towards the private sector. The coming together of NITI Aayog’s plans on public-private partnerships in healthcare, and National Health Policy’s plan to increase private sector buy-ins and the NHPS plan to route public health to the private sector would be contentious for India in the long run. Already dominant private healthcare providers will flourish further and an already weak public setup will not be strengthened. An uncritical promotion of privatisation at the cost of public money without proper regulation would do more damage than good on fiscal and health fronts. Shailender Kumar Hooda is an Associate Professor at the Institute for Studies in Industrial Development, New Delhi. Views expressed are personal.